Austin won the award for the lightest baggage, claiming to have brought with him just two pairs of undercrackers and some anti-perspirant. Martin on the other hand broke all records with his baggage weighing in heavier than himself. Some of the party decided on an overpriced full English breakfast and this is where the problems started. By the time the last rasher of bacon had been devoured it left some of us, the honest ones not prepared to queue jump, struggling to make the aircraft on time. There was no problem for Damo who is learning to do word searches even though for some reason he is of the opinion that that you cannot do them until such time as the safety belt light goes out. The biggest interruption before the flight was Austin and Dan fighting for the window seat but eventually we were all, yes all, airborn and on our way to Italy - the land of the World Cup winners and some dodgy goings on. There were some in flight problems as one passenger didn't approve of people talking and in no uncertain terms told me to shut up because he wanted a quiet flight. My only response came was made of words not allowed on this site's message board. At this point we were requested to fasten our safety belts and so Damo had to stop word searching, and I am told he had even found a word. Me, I was stuck next to this irritating man of silence, I did kindly offer to buy him a pair of ear plugs. 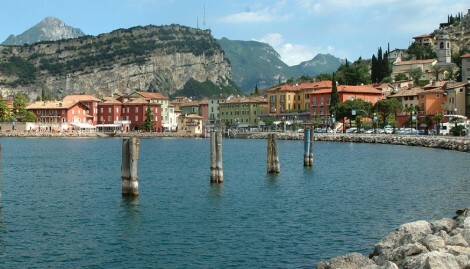 We finally reached our destination of Desenzano del Garda around 1:15 p.m. local time, and what a fantastic place it is. We've already had a drink, something to eat, a tasting of the brilliant Italian ice cream all followed by a game of football in the lake. It is rest time now - as we get ready for a night out, a much needed early night and then off around the lake tomorrow before going to the game, all in the Clarets Mad Italian Job.